Speaking of Sardines, I am stilll upset by the anti-trust settlement which took the good old “Possum Brand” Maine Sardines out of production. Yes, it is true. Do some internet searches and you can find the story. I had them as a kid. Hi There ! Our daughter just found this photo of our boat, The Double Eagle, online. What a beautiful shot of her loaded, headed to Stonington or Swan’s Island. 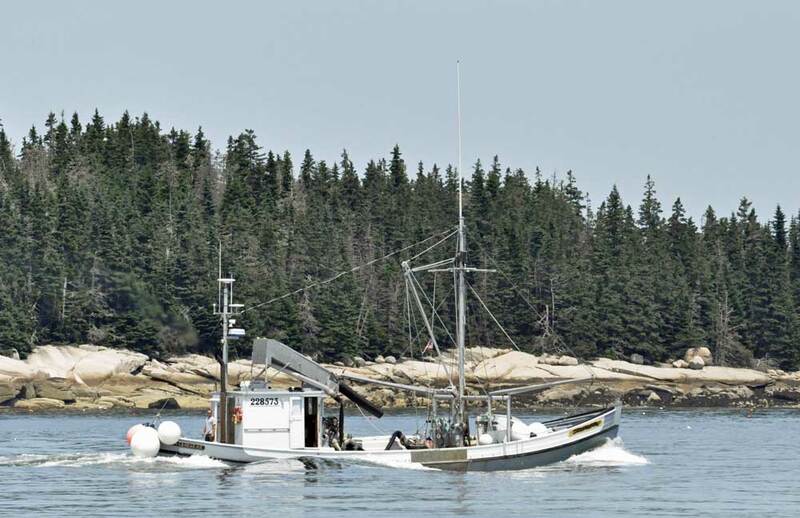 You caught the beauty of a working boat, doing what she’s been doing on the coast of Maine since 1929. There have been three owners of this vessel. Two of them have the same name, Glenn Lawrence ! The original owner was from a family in Belfast and there was once a brand of sardines named after the boat. Thanks so much for such lovely words. We love her, too ! Thank you for keeping such a beautiful vessel. And thank you for the history lesson. I once had the privilege of spending time with Paul and Emme Bennet, two lovely people I believe you knew. Paul always told me that Double Eagle was the most beautiful carrier found anywhere along the coast. He had high praise for how impeccably you restored the vessel and kept her working in such magnificent condition. The Double Eagle is one of my favorite working boats , double ender’s are not all that common. When you run across one as impeccably maintained as this one, it surely does catch your eye. I have several hundred photo’s of her, most in Rockland, some in Vinalhaven, but my favorite, and one which has paid me very well, is a shot I took of her as she was approaching Owl’s Head, late in the day. Also, Hello to Barry and Jen, it’s been years since I sailed on Mary Day, but I still have fond memories of that week. When I am in Camden, I occasionaly catch a glimpse of you, Be well, and good fortune to you and your family. Hello Floyd! Thanks so much for sharing your thoughts. We will look forward to seeing you in Camden.